When you talk about tourist attractions in the small town of Gulmarg, the word “ Gulmarg Gondola “ comes to mind the first. There are plenty of other places to see as well; but Gondola is what really draws thousands of tourists here each year; both local and also from other parts of the country. So popular it is that during peak tourist season; you may have to get in line and wait for hours before you will be able to board a Gondola. As a matter of fact, not just Gulmarg but a Gondola ride is considered among prime attractions of a trip to all of Kashmir. Why? Because it is the world’s second highest Gondola ride. For a brief introduction, Gulmarg Gondola is one of the world’s highest operating cable cars; ferrying tourists from Gulmarg town to the top of nearby Apharwat Peak. A joint venture between the J&K government and a French firm Poma, this two-stage ropeway is capable of ferrying about 600 people per hour. It is divided in two stages; or more popularly known as two Phases. What these phases are and how you can plan for this cable car ride is what I will explain in the article below; along with a few other tips based on my observations. Question that comes to mind is why the word Gondola so let me start by first explaining that. It is not the name of any company as some people believe. Gondola is actually a traditional, flat-bottomed rowing boat that they use to ferry passengers in Venice. The same name then got used for several other means of transport as well like Rail, Balloon, Airplane, and Ferris wheel etc. In case of a cable car, the word actually is “Gondola Lift” because this is what it actually is. 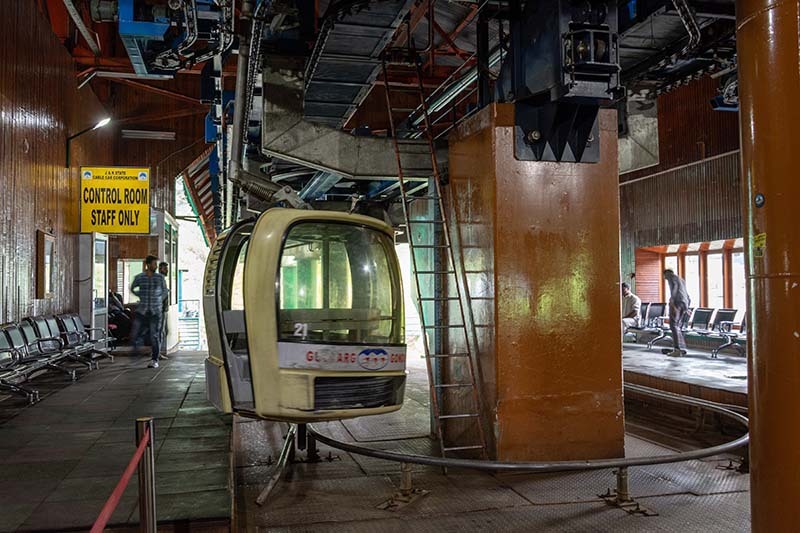 Like a regular lift in a building that takes you up and down between floors, a Gondola in Gulmarg is also a lift that will take you up and down a mountain. It is a word that actually means boat but is also used for all cable cars across the world. There are two phases of Gulmarg Gondola. Gulmarg town is the starting point of the ride and the top of Apharwat peak is the end point. Kungdoor is the center point in between. Let me post a picture of it. In the above picture, the spot where I have written 1 is the starting point of Gondola ride. Number 2 is the middle spot, the Kungdoor station where Phase 1 ends. Number 3 is the finishing point of Gondola ride; the end of Phase 2. Number 4 is actually where Alpather Lake is located at the top. The mountain that you see in the picture is the Apharwat peak. So while planning a ride, the first thing you will have to do is to reach the Gondola boarding point. 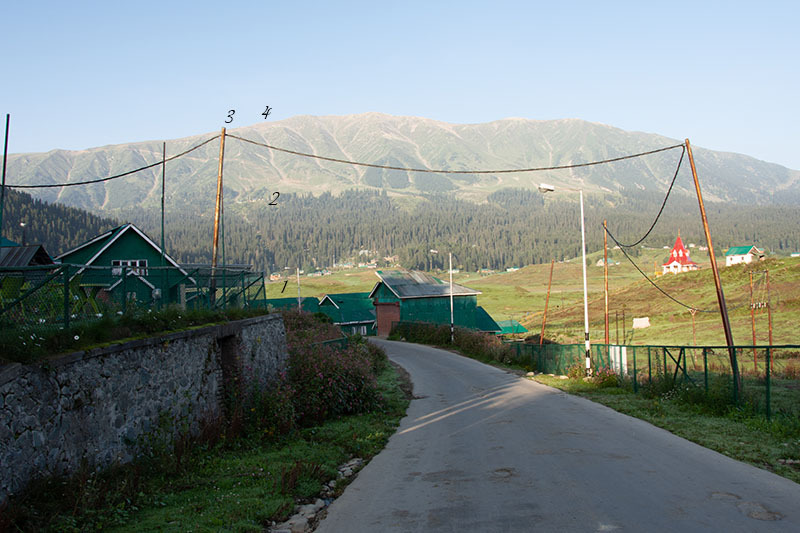 Depending on where you are staying in Gulmarg, you may have to do a bit of walking to get here. Just ask anyone for directions and you will get pointed towards where to go. If you are here during peak tourist season then just follow the crowd. In the end, you will arrive at this building. It looks like a hotel but is actually the entry gate of Gulmarg Gondola. They have the entire set up inside including the huge waiting hall and the boarding point. I will post a few pictures again. And this is the spot where you jump on the Gondola. It is inside the building. The Gondola actually continues to remain in movement and never stop. So yes, you will actually have to get in while it remains in motion. It will not halt and wait for you get on board. The ticket counter however is outside so make sure you buy the tickets first before getting inside the building. This is the booking window. So once you have the tickets in hand, you will board the Gondola for phase 1. If you were there during off-season, there will be no waiting time involved. Like I for example was there during mid-August and we were the only ones buying tickets. In tourist season though, I have heard that people had to wait in long queues both while buying tickets and then at boarding point. Once you get on board, it will take about 10-12 minutes at most and you will arrive at the Kungdoor station; the end point of Phase 1. Yes I know, it is too short but that is all there is to it. At Kungdoor station, you will get off the Gondola and step out. This is what will be waiting for you outside. The ride maybe short but the view is what makes it all worth it. I cannot post too many pictures here because then the page will get heavy but I have posted them on the forum post A few pictures of Gulmarg Gondola Ride. You can take a look at the pictures there. There are a lot of small teas stalls, restaurants as well so you can step out, walk around, enjoy the vistas and have something to eat. There is also a small waterfall nearby at about 2 kilometers of a walk. If you want to, you can also walk to the waterfall but do note though that it is actually a very small one and nothing too great. The 2 kilometers of walk however is quite steep and will definitely take it out of you. A lot of people and mostly families travel only till Phase 1 and go back from here. If you however want to go further then you board another Gondola to the top of nearby Apharwat peak. This is Phase 2. 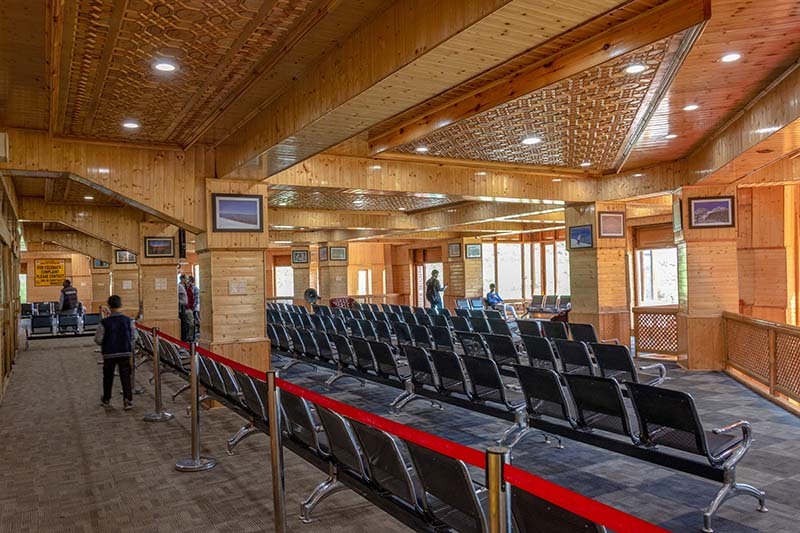 You will have to buy tickets for both Phase 1 and 2 from the booking counter at Gulmarg only so keep that in mind. There is no booking counter at Kungdoor. For people going to Phase 2, do not step out at Kungdoor station. Get off the 1st Gondola and right next to it is the boarding point for 2nd one. Phase 2 as well is a 10 – 12 minutes ride and will bring you to the top of Apharwat peak. The vistas however will improve tremendously and you will really enjoy the natural beauty around. There are no eating points here. If you are a bit adventurous type, then you can trek to the nearby Alpather Lake; about 4-5 kilometers of walk away. Do remember though that this is another steep climb and is a bit difficult. I have explained this trek in another post How to Plan a Trek to Alpather Lake. This is the place where you catch a Gondola for Phase 2. As you can see, it is a different lift; but like the previous one, this one too remains moving while you will step inside. And this is where Phase 2 ends. The green building is the Gondola station. Once you step out, you can then start walking to your right for Alpather Lake, like we did. 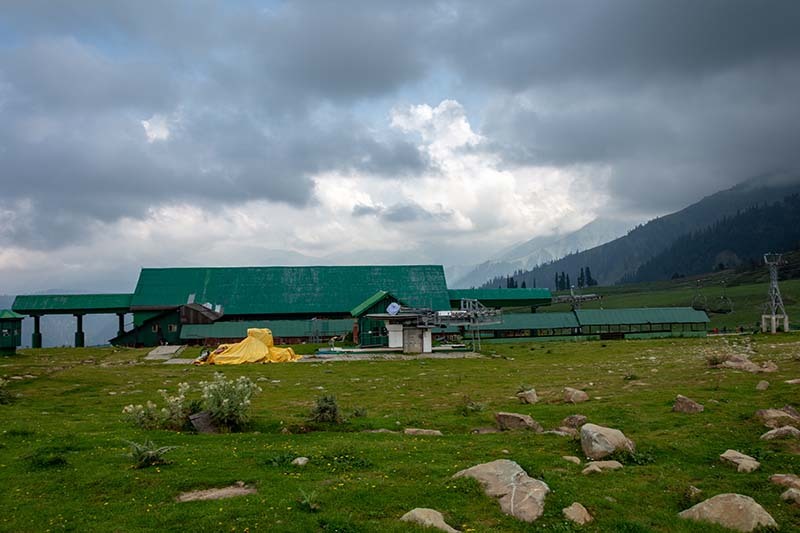 A better way of doing the trip would be that you come straight to Phase 2 from Gulmarg first. Walk around and enjoy the beauty at top of the mountain. Trek to Alpather lake if you wish to. Then on your way back, get off at Phase 1 and step out. See the meadows here, eat around and then take the Phase 1 Gondola back to Gulmarg. Good to know information is that the end of Phase 2 is not really the top of Apharwat peak. It actually is at Kongdoori Mountain, a shoulder of nearby Apharwat Peak. Top of Apharwat is again 5 kilometers of trekking towards Alpather Lake, to your right as you will notice in the first picture I posted on this page.. Standing up here, you can see the actual line of Control and Pakistan administered Kashmir. And that is pretty much it. That is your Gulmarg Gondola ride which by time it ends will definitely leave you wanting for more. Sitting in a small cabin at such great height with nothing beneath for several hundred feet is quite a thrill. Views you get from the Gondola and then from Kungdoor and Apharwat will blow your mind away. There are two ways that you can buy tickets for Gondola ride. You can either get it in person upon arriving at the counter. Or you can buy it online from the official Gondola Website. Price is same either ways and ironically enough, buying online is actually more of a hassle. It doesn’t really give you a ticket that you can just print and go board the Gondola. Once you make payment and buy the ticket online, you will still have to get in a line at the booking counter and collect your boarding pass. Not many people know this and almost everyone ends up buying online. Due to this, often, the cash counter will only have a handful of people buying while there would be a long queue at the online counter. So my advice would be to avoid buying online and get the ticket in cash from the counter itself. You will have to get in a line anyways so why bother with the entire online thing. Also, you will have to produce a valid photo ID so don’t forget to bring one. Without it, you will not get the tickets. Aadhar Card, driving license, voter’s ID or PAN Card, any government issued ID card will do. The fare of Gulmarg Gondola is different for both the phases. You will be buying from the same counter but in fact will receive two different tickets. Fare for Phase 1, from Gulmarg to Kungdoor, is Rs. 740 per person. Fare for second phase, from Kungdoor to Apharwat peak is Rs. 950 per person. During summer, Gondola ride for Phase 1 starts at 9 AM and at 10 AM for Phase 2. During winter season, the ride starts at 10 AM for Phase 1 and at 10:30 AM for Phase 2. During summer, the ride is closed at 5 PM for Phase 1 and at 4 PM for Phase 2. During winter, this time is changed to 4 PM for Phase 1 and 3:30 PM for Phase 2. For phase 1, you will start from Gulmarg at an altitude of 2,650 meters and arrive at Kungdoor station, at a height of 3,100 meters. For Phase 2, you will then climb up to a height of 3,980 meters at the top of Kongdori mountain. From here, if you are up for it, you can then trek to the top of Apharwat peak at 4,200 meters. If snow is what you seek then the best time would be the month of February when the entire region is buried under a thick sheet of snow. For green valleys, you can visit either in April or August. I will however not recommend a Gondola ride in the months of April, May and June because it tends to get too crowded at this time. You will end up waiting in long queues, will spend an entire day and will get more frustrated than enjoying the ride. Let me explain it by giving a month by month breakdown. Gulmarg Gondola in January: It is really the time for skiing and you will see plenty of skiers around.Gulmarg is known as one of the best skiing spots in our country. The Chair car is specially build to take skiers to heights with all the equipment so they could then Ski down. There will be plenty of snow and the weather too can sometimes turn unpredictable closing the ride temporarily. Gulmarg Gondola in February: Pretty much the same deal as January except for the fact that the amount of snow would be far much greater in February. February is the best time for a winter trip to Gulmarg. Gulmarg Gondola in March: Snow would start to melt from the ground and would mostly be limited to upper areas by end of the month. Very less chance of ride closing due to bad weather. Gulmarg Gondola in April: Plenty of greenery around and snow will be limited to upper areas like Phase 2. But it would start to get too crowded by Mid-April. 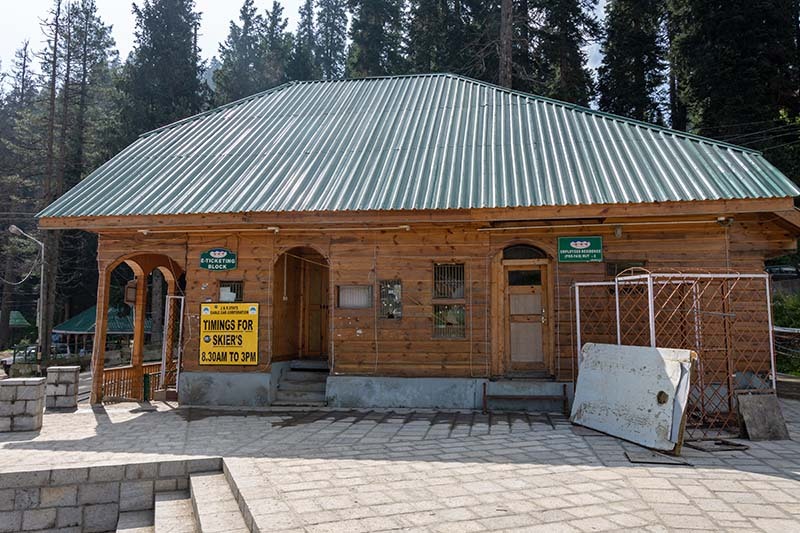 Gulmarg Gondola in May: It is not really a good time because visiting in May means hours of waiting in lines. A Gondola ride of just about 20 to 25 minutes will see you spending the entire day waiting in line to get on a lift. Gulmarg Gondola in June: Same deal as May. 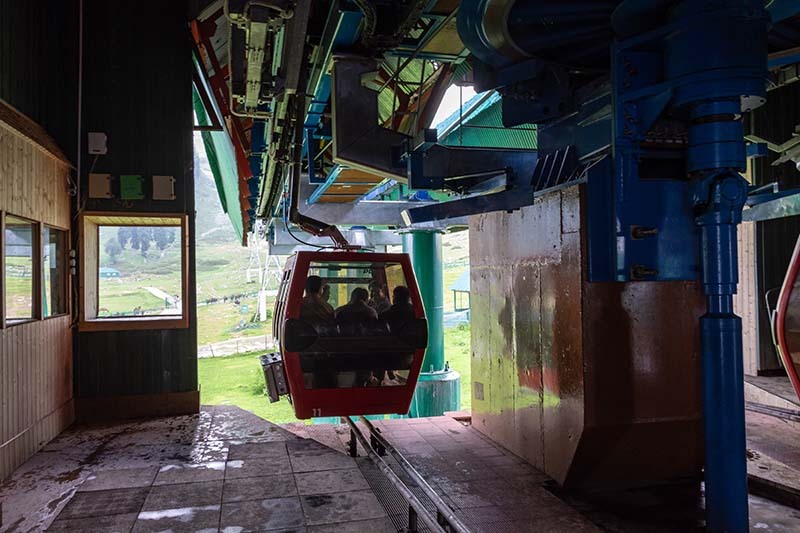 Gulmarg Gondola in July: It will start to be less crowded. Monsoon would arrive in July and if the weather turned bad, the ride may be closed temporarily. 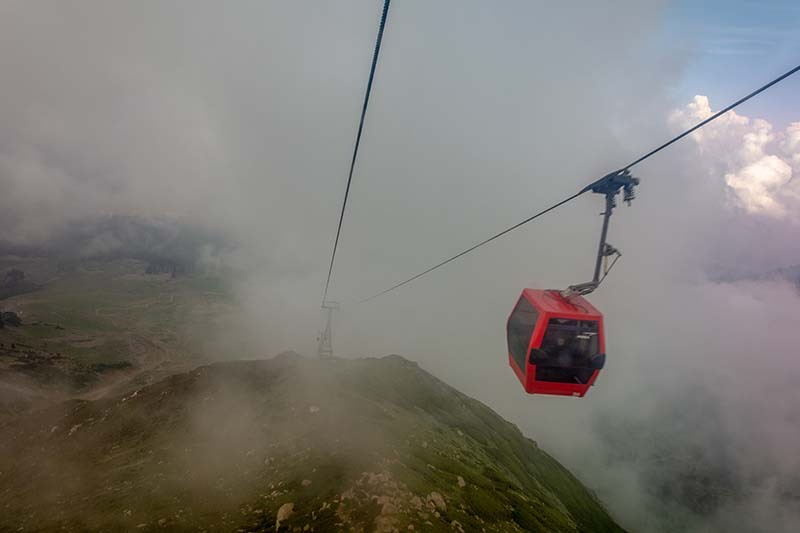 Gulmarg Gondola in August: This is the month when the ride is least crowded. When I was there in August, we were the only ones buying tickets. As a matter of fact, we were the only tourists in entire Gulmarg. Gulmarg Gondola in September: Same as August but it will start to be colder. Gulmarg Gondola in October: Autumn is here and the vistas will turn to more Orange. However, It tends to get crowded again in October. Gulmarg Gondola in November: There will not be much snow but weather will be too cold. It won’t be too crowded in this time though. Gulmarg Gondola in December: Same as November except for the fact that after Mid-December, it can snow in Gulmarg anytime. 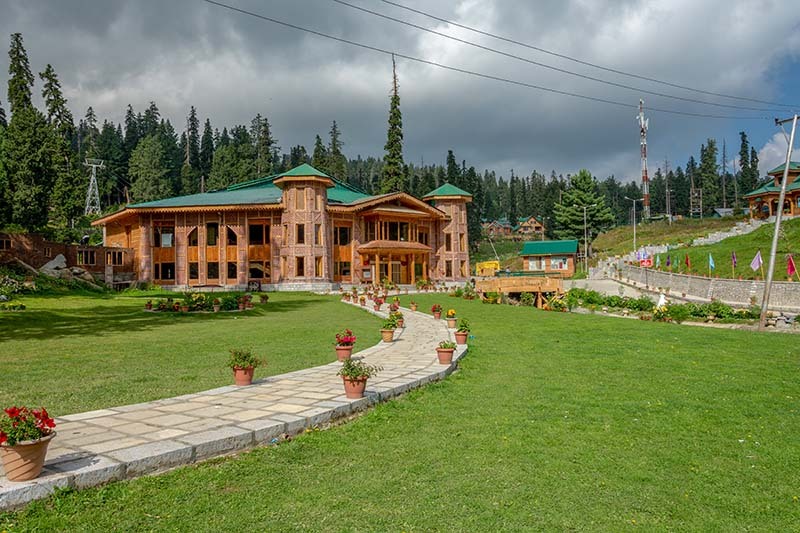 There are plenty of hotels in Gulmarg and you can easily find a hotel nearby. The entire town to be honest is not that big and no matter where you were staying, you can easily just walk to the entry point of Gondola ride. Or else, you could just catch a Pony ride which is available here in plenty. The entire town of Gulmarg is infested with guides and pony owners. They will attach themselves to you and won’t give up no matter how many times you say no. You cannot walk here 100 meters without a pony owner offering you a ride. Same is the case with guides. The moment you enter a hotel, they will be waiting for you there. There are two problems basically. First is that they have absolutely nothing to offer. There is nothing in Gulmarg that they can show you that you can’t see it on your own. For the Gondola ride as well, a guide will just tag along, walk with you and charge you money for it. There is no huge history here that they can tell you. No hidden place that only the guide will know about. He will just be walking with you and that is pretty much it. Second problem is that they ask for way too much money. I mean I don’t mind giving a small amount of money to a local guide and let him accompany me just in order to help someone in need. But I am not going to pay Rs. 1,000 to someone just to let him walk with me for no reason. These guys will lie between their teeth; telling tall tales about places they can show you; viewpoints that only they know about. Truth however is that they got nothing. This one guide asked me Rs. 2,500 to show me the way from Phase 2 to Alpather Lake; that they call as “Frozen Lake”. I realized later on that there was no need for a guide. You just need to stay walking to your right from the Gondola station and you will reach the lake; anyway which even I did on my own. If I had paid him Rs. 2,500 then I would have cursed myself for being a fool that big. And then they have the audacity to even argue and fight with you. There have been incidents of fights among tourists and guides here because they asked too much money and lied about what they were going to offer. The tourist, unaware of the reality, agreed; only to realize later on that he was being cheated and getting overcharged. When they refused to pay the agreed amount, it resulted in all the guides ganging up on the tourist. There was in fact a police complaint files against the pony owners and guides here in Gulmarg because it all just became too much of a nuisance. And trust me when I say this, you can’t walk in Gulmarg without someone trying to be your guide and get some money out of you. The police took some action against them back then but then slowly it just got back to the old route again. My advice is to avoid them at all cost. Just walk your way and act like you can’t see or hear them around. They will be all around at the booking counter but just ignore. The only time when you can hire a guide is if you are there in peak tourist season. When it gets to crowded, they can then go stand in the queue on your behalf and arrange the ticket. I have heard that they can even manage to let you bypass other waiting tourists and get your ride done quicker. But this again is a hassle for the tourist who refused to pay money to these daylight robbers; because then he is going to have to wait even longer because guides will keep breaking the queue and bring people at front. My advice again is to manage the whole thing on your own and avoid even talking to these “thugs”. This questions actually now get asked after the accident that claimed 7 lives including 4 tourists and 3 local guides. A tree nearby uprooted, fell on the cable and swung it so hard that everyone inside the gondola fell out to their deaths. Yes I know that sounds scary. The fact however is that it was an unfortunate accident; but the tourist rush for Gondola is still the same. I am inclined to say that yes it is completely safe; but I know the families of the deceased will never agree to this. When is Gulmarg Gondola Closed? The Gondola ride remains open throughout they year except for the times when the weather is a bit extreme; specially during winter and monsoon season. If it is snowing a bit too much; or raining with high winds then the ride is closed for safety reasons. “Frozen Lake” is what the guides call it; even in the months of July and August. Fact is that this lake is frozen only in winter; not in summer. In order to get to the lake, after you arrive at the Phase 2 Gondola station, just start walking to your right and you will get there. Fun fact is that there is actually a motorable road up here to the lake that Army uses. So you don’t even need to climb anywhere. Just keep walking to your right on the road and it will bring you to the lake. I have posted a step by step trek guide with pictures here; How to Trek to Alpather Lake on Your Own Easily? And that is pretty much it. That is all that you need to know about Gulmarg Gondola. 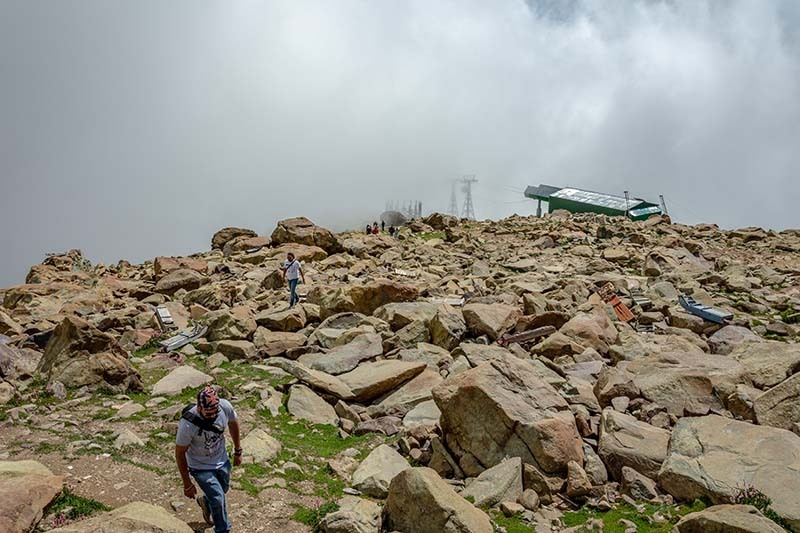 If you wish to get a more visual guide of the details above, then take a look at the photo guide that I posted at the forum, Gondola Ride in Gulmarg – An Amazing Experience. I hope the information above was of help. If you have any other questions, please feel free to ask in the comments section below; or at our Community Forum; and I will be glad to answer. Need your help. I have purchased tickets for phase 2 only. Do I have to have phase 1 gondola tickets in order to reach phase 2 or can it be done via road. Am tripping on December 23rd 2018 so need a quick response please. yes you will have to buy tickets for Phase 1 as well. There is no road leading there to the Phase 2 boarding point. Thanks Ritu and yes, I completely agree on the guides and the pony owners part. They are actually a nuisance for tourists. Won’t let you walk in peace even for 100 meters.